They are just going to fall out anyway, so why should I stress about taking care of baby teeth? If you’re anything like me, you’ve uttered this exact sentence every.single.time you think about brushing your baby’s teeth (tooth?) or gums. But actually, taking care of baby teeth does matter. Cavities are expensive and painful, and teeth that have to be extracted early can cause surrounding teeth to tip and drift into the space. If baby teeth shift, it can create spacing issues for permanent teeth when they erupt. And do you really want your baby to go under anesthesia? Bottom line: having a cavity-free slate of baby teeth helps minimize the chances of dental complications with a child’s gums, jawbones, and oral alignment. Cavities (“caries” in formal dental lingo) are on the rise in young children (especially 2-5-year-olds). By the time they turn 5, well over half (60%) of children have had at least one cavity. 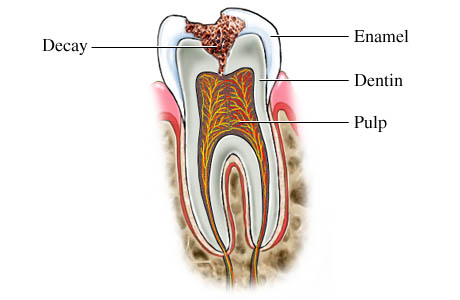 If you didn’t know (because I didn’t), cavities are tooth decay. Here’s how cavities develop (because again, I didn’t know): we all have naturally-occurring bacteria in our mouths, and when we eat sugary and starchy food and drinks (like candy, crackers, “bars,” bread, squeeze packets, juice, etc. ), that bacteria eats the sugar, and in so doing, produces acid. The mix of bacteria and acid forms plaque, which eats away at our teeth enamel, and eventually can start to make holes in our teeth. Next thing you know – you have yourself a cavity! With proper oral hygiene and cutting out unnecessary sugary foods and drinks (and brushing well after consuming sugary and starchy things), cavities in young kids are totally preventable. But I don’t really need to brush my toothless baby’s gums, riiiiight? If you watch this video and go, “whaaat? ?”, you’re not alone. While these are the best practices, most of us here at Lucie’s List never cleaned our babies’ gums and they’re just fine, so…… there’s that 😉 In fact, most people will look at you like you’re crazy if you ask them if they clean their baby’s gums. But… I get the point! They want your baby to get into the habit of having their teeth cleaned. Imagine trying to make a 3-year-old sit in a car seat for the very first time after never having done it. It wouldn’t go very well! But since they’ve been doing it since birth… they don’t argue about the car seat (well, maybe a little). Again, the most important thing you can do – as a parent – is to limit sticky, starchy or sweet foods (i.e., raisins, juice) – bacteria will have a field day with these. However, this does not apply to fruit! Fresh fruits and vegetables are great for oral hygiene; they actually help keep teeth clean because of their texture and fiber content. Score for whole foods! An apple a day… keeps the dentist away?? Also very important: avoid sending babies or children to bed with a bottle or cup of anything – this includes milk, formula, juice, and even breastmilk. Okay, so now that my child actually has teeth, what should I do? This is where taking care of baby teeth really comes in! As soon as your kiddo’s first tooth comes in, it’s time to clean it. “Time to brush your tooth!” LOL. This means brushing twice a day (are you kidding me? yes, this is the recommendation). You can either use the gauze/washcloth approach or upgrade to an infant toothbrush (we like the Green Sprouts Silicone Baby Toothbrush). More product recs below. All it takes is a few confused, uninformed (but vocal!) people to say things on the internet to spark a debate and cause mass confusion. Like most things in the world, fluoride can be toxic in high quantities. This same holds true for things like alcohol, coffee, potatoes, pears, nutmeg… cinnamon. Quantity matters. That said, here is the research. Fluoride is a naturally-occurring element that helps protect teeth. This “magic bullet” strengthens teeth and prevents tooth decay by helping teeth resist the acid buildup that leads to cavities. Fluoride can interrupt, and even reverse, the process of tooth decay. Fluoride works so effectively that the Centers for Disease Control and Prevention (CDC) named water fluoridation one of the top “Ten Great Public Health Achievements in the 20th Century.” Thanks to wide-scale water fluoridation in the second half of the 20th century, the incidence of cavities in the U.S. plummeted. In fact, water fluoridation was so effective that soon fluoride was added to pastes, gels, rinses, and tablets, among other things. Read also: Is Water Fluoridation Safe? Just as with water fluoridation, there is also now no debate about whether to use fluoride toothpaste for children – the best experts all agree you should. Because children are liable to swallow toothpaste, and because consuming too much fluoride can be harmful, dentists used to advise parents not to use fluoride toothpaste until kids were two. But new recommendations suggest that even babies benefit from a little bit of fluoride, as mentioned above. How much is a little bit? When babies get their first teeth, it’s also time to start using a tiny smear of fluoride toothpaste (think: grain of rice) when brushing. Keep this habit in place – twice daily brushing with a smear of fluoride toothpaste – until your child turns 3, at which point you can up the ante a little bit and start using a pea-size dollop of fluoride toothpaste (see illustration below). So as of 2014, the AAP, the ADA, and American Association of Pediatric Dentistry all recommend fluoride toothpaste for children of all ages – including babies. But, it hinges on using the correct (read: small) amount of toothpaste. It’s the act of brushing that matters, not so much the toothpaste. “Toothpaste is merely a good-tasting vehicle to get kids to like putting the toothbrush in their mouths. Some [toddler toothpastes] are a little gritty and aid in removal of debris, but it’s the act of physically brushing the teeth, even with water, that’s the most important for babies and even young toddlers. If there is no fluoride in the toothpaste, the amount doesn’t matter. For older toddlers and young children, fluoride helps to strengthen the enamel. Even the slightest amount, less than a pea (barely coat the bristles) is enough. The basis for using only a tiny bit is because young kids can’t really spit it all out before ages 4-6, and will get a tummy ache if they swallow too much. Thus, for 1-3 year olds, even a tiny bit of fluoridated toothpaste once a week is enough. Once they can reliably spit, a pea sized amount is adequate. But again it’s not the toothpaste that is most important; it is physically brushing all the surfaces of the teeth and rinsing with water that is most beneficial. And not eating or drinking anything but water after bedtime brushing. Sugar sits in the crevices of teeth and between the teeth, so it is imperative to remove it before bedtime. Some pediatricians will say that as long as parents are taking good care of their kids’ baby teeth, they don’t need to visit the dentist until they are 3, but pediatric dental guidelines advise parents to visit the dentist by the time children turn 1. Is this overkill? That said, a visit to the dentist at such a young age may not be all that practical or realistic — especially for parents who don’t have dental insurance. I get it. It seems a bit extreme to take time off work and spend $100 just to familiarize your one-year-old with a dentist office (something they’ll never remember anyway). When you do go, you can choose to see either a pediatric dentist, who will have had between two and three years of additional training in pediatric dentistry (and only sees children), or a family dentist, who sees patients ranging from infancy through adulthood. Either is fine. Some pediatric dentists offices are kinda fun! After the first visit, it’s best to take kids to the dentist twice a year (just like adults). Much like brushing and generally taking care of baby teeth, going to the dentist early and often is really all about establishing good oral health care routines, and preventing (or treating) any emerging dental problems. We recommend the Baby Banana as an introductory toothbrush (also serves as an awesome teether – yay for two-in-ones!) to gnaw on after meals, and before bedtime. If you’re having a hard time getting an actual toothbrush or even a washcloth in your baby’s mouth, check these out. They come with a cute little book about brushing — we LOVE Brushies! We love this starter toothbrush because of the wide handle, which makes it easy for little (and big!) hands to hold. Bonus: there are colored bristles on the toothbrush head that indicate exactly how much fluoride toothpaste to use. Again, this is personal favorite; it has a safety shield to prevent babies from choking and is the perfect size for little mouths. For babies and young toddlers, remember it’s the brushing that’s important, not the toothpaste. Make sure your pick has the ADA Seal of Acceptance on it to ensure it’s safe, effective and doesn’t contain extra flavoring that may lead to tooth decay (because that would be ironic!). Some tried-and-true fluoridated recs include: Crest Pro-Health Stages Toothpaste, Tom’s of Maine Natural Anti-Cavity Toothpaste and Colgate Children’s 2-in-1 with the caveat about just using a small smear. Check out this video on the basics of baby brushing, fluoride and visiting the dentist. In this video, a dentist shows us how he brushes his own baby’s gums. Lastly, this video from CloudMom, demonstrates how to clean baby’s gums and teeth from birth through 12-months-old. That’s it for now. Happy brushing and taking care of baby teeth! We’ll deliver more dental info to you around 20-months, when your baby has turned into a toddler — yes this will really happen– >with lots of actual teeth! FRANCISCO J. RAMOS-GOMEZ et al., “Pediatric Dental Care: Prevention and Management Protocols Based on Caries Risk Assessment,” Journal of the California Dental Association 38, no. 10 (October 2010): 746–61; Melinda Wenner Moyer, “You’re Not Brushing Your Toddler’s Teeth?,” Slate, July 29, 2016, http://www.slate.com/articles/life/the_kids/2016/07/do_toddlers_need_to_go_to_the_dentist_and_brush_their_teeth_every_day.html. Brittany Seymour, “Find A Dentist – American Dental Association,” accessed July 31, 2017. CDC, “Achievements in Public Health, 1900-1999: Fluoridation of Drinking Water to Prevent Dental Caries,” Morbidity and Mortality Weekly Report 48, no. 41 (October 22, 1999): 933–40; Tanya Walsh et al., “Fluoride Toothpastes of Different Concentrations for Preventing Dental Caries in Children and Adolescents,” The Cochrane Database of Systematic Reviews, no. 1 (January 20, 2010): 2, 3, 21, doi:10.1002/14651858.CD007868.pub2; Valeria CC Marinho et al., “Fluoride Varnishes for Preventing Dental Caries in Children and Adolescents,” in Cochrane Database of Systematic Reviews (John Wiley & Sons, Ltd, 2013), doi:10.1002/14651858.CD002279.pub2. Marinho et al., “Fluoride Varnishes for Preventing Dental Caries in Children and Adolescents,” 20–21. Other selected sources consulted: “Dental Hygiene: How to Care for Your Child’s Teeth,” Familydoctor.org, September 1, 2000; “Teaching Toothbrushing| The Trusted Resource for Parents,” Ask Dr Sears | The Trusted Resource for Parents, August 23, 2013; The Children’s Hospital of Philadelphia, “Dental Health Overview,” Text, (August 23, 2014); The Children’s Hospital of Philadelphia, “Your Child’s Dental Health,” Text, (May 5, 2014); “For the Patient: Taking Care of Your Child’s Smile,” Journal of the American Dental Association 145, no. 5 (May 2014): 504; The Division of Oral Health (DOH), “CDC – Children – Division of Oral Health,” July 20, 2017; NHS, “Children’s Teeth – Live Well – NHS Choices,” October 1, 2017; American Academy of Pediatric Dentistry, “FAQs,” n.d.; Southern Maine Pediatric Dentistry, “FAQs About Dental Care,” n.d.; Seymour, “Find A Dentist – American Dental Association”; Alexandra Zissu, “The Fluoride Conundrum: Is Fluoride Safe For Kids?,” accessed July 31, 2017; Saint Louis, “Dental Group Advises Fluoride Toothpaste Before Age 2”; AAP, “FAQ: Fluoride and Children,” HealthyChildren.org, accessed July 31, 2017; “Fluoride Toothpaste Use for Young Children,” The Journal of the American Dental Association 145, no. 2 (February 1, 2014): 190–91, doi:10.14219/jada.2013.47.